This is, very probably, the sign of things to come. With ARM boards becoming ever-more cheap, accessible, powerful, and efficient, the same technology that is transforming phones, laptops, tablets, and other categories can just as easily be the foundation of a musical instrument. And one “computer” in your life might not look like a conventional desktop or laptop. How do you load patches on the Organelle? Any USB stick will work? And then you have access to the file system for Pd? Yep, any old USB stick will work. Pd has access to both root file system and USB (just like a larger computer) but we like to keep root file system in read only mode so the machine always boots up to the same state no matter what, so all the Pd related file I/O happens on the USB stick. In terms of playing and recording sound files, you are really only limited by the size of USB stick. What’s that HDMI out for? Could you do visuals on this? Or I assume it’s just to see the interface somehow? You can connect an HDMI monitor (and USB keyboard/mouse) and fire up a simple desktop environment and edit/create patches right on the device. We have done preliminary HDMI visual experiments, and it is definitely a possibility, but we are focusing on audio right now. Yes, in normal operation Pd runs -nogui. When you connect a monitor and start desktop, Pd runs with gui for editing. 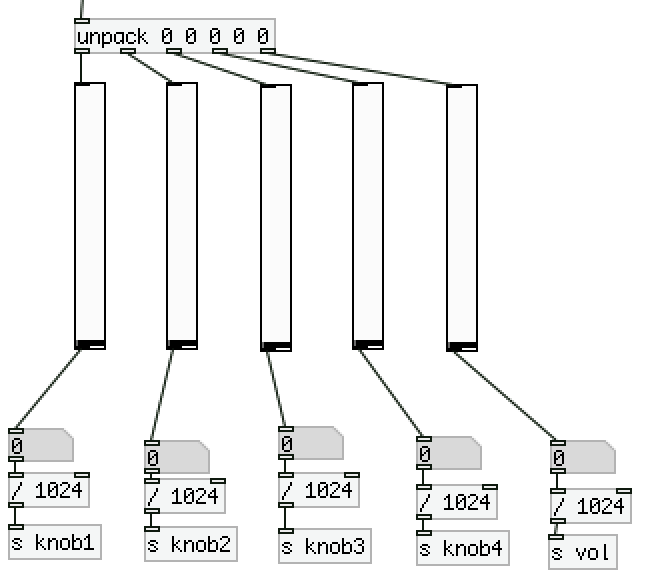 This way, a patch has no dependencies outside of Pd, so a patch can be run on the Organelle, a laptop, or even a libpd environment without any modifications (just needs a mother patch to send and receive with, or the mother program in the case of libpd). When you say “low-level” programming is possible, what do you mean? Also, as mentioned earlier, if ‘main.pd’ is not found in the patch folder, the Organelle will search for ‘run.sh’, which can be used to launch any custom program you like. 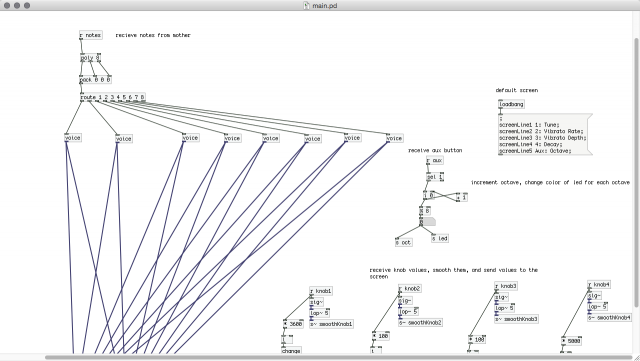 So you could write a program in C that opened the ALSA sound device directly and started making sound. Or use a different programming environment all together — we have done preliminary testing with both Chuck and SuperCollider and they both work. It is Arch Linux-based build, kernel 3.14. What’s available on that screen as far as menus? There are really just 2 screens, a menu, and a patch detail screen. The screen has a simple menu for system-related things like shutting down, simple configs, ejecting USB…. and then a list of patches. When you select a patch, a second patch detail screen comes up that indicates what the four knobs and extra button do. This information is sent from the patch itself. In Pd, you can send messages to the screen to display text (e.g. [s screenLine1]). 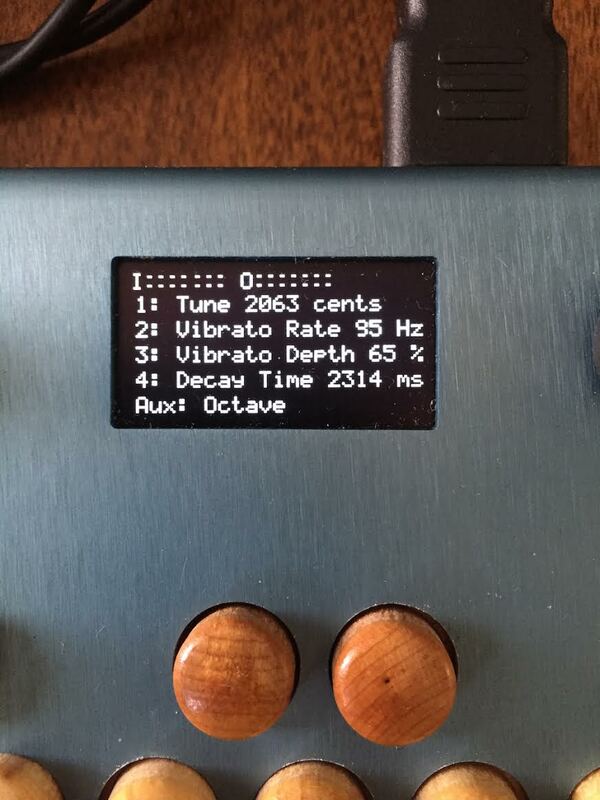 This is very useful, because the knobs can report the actual parameters (not just “Delay Time”, but “Delay Time 452 ms”). You could also print information other than Knob/Aux button status. For example, you could say: “Use this Patch on our first song” or “Make sure Knob 2 is set to 2 o’clock to start” or some other kind of note helpful for a performance, etc. Picture: a version of the mother.pd patch, an actual patch in Organelle format (BasicPoly), and the resulting patch detail screen. Thanks Chris and Owen. It’s funny, I’ve had lots of conversations over recent years about people wanting to do stuff like this. It’s great to see it in an actual product. 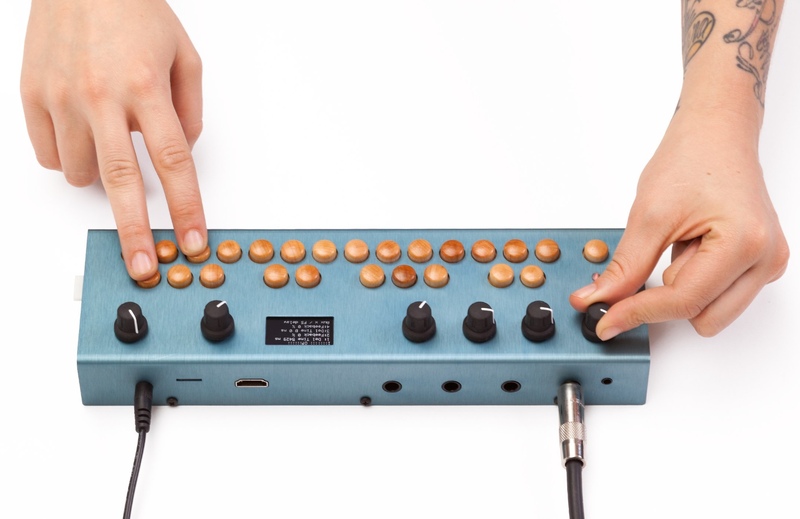 (And I’m sure that will inspire more, in other form factors, which could be fun… like Eurorack for software patching lovers, a new breed of instrument.) But the implementation here already sounds eminently intelligent. I want one; can’t wait to see it.